Disclosure: This is a sponsored post by Home Decorators Collections all opinions are mine. It’s the most WONDERFUL time of the YEAR! 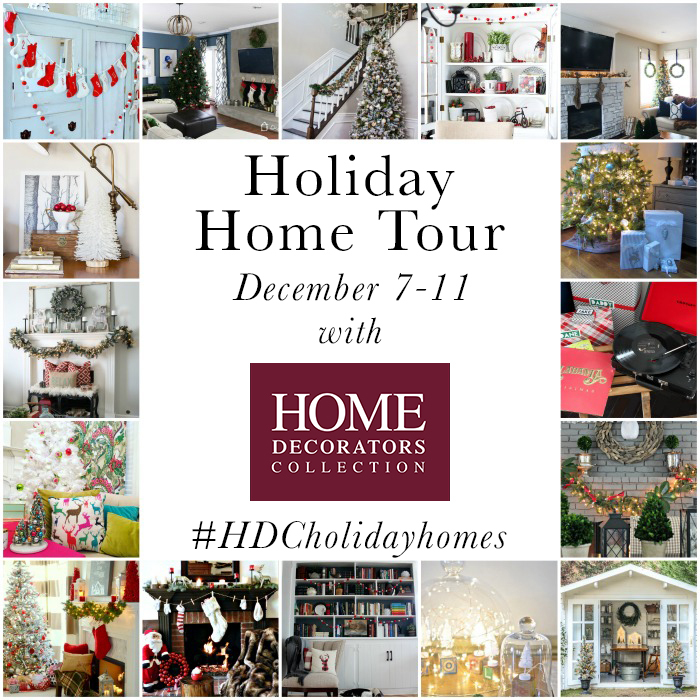 It’s Holiday Home tour time and this year we are partnering with Home Decorators Collection and 15 other amazing bloggers for the most incredible Holiday Home Tours! If you are stopping by from my friend Tasha’s blog Designer Trapped then welcome we are so excited to have you here! We’d love to have you stick around so make sure you subscribe to our newsletter so you never miss a thing. Now on to the tour! As many of you know I have never met a color that I don’t like! Whenever our two year old asks “Mommy, what’s your favorite color?” my answer is “All the colors!” I mean in a house full of boy’s I deserve to have a little fun with colors especially like with my pink rolling ottoman check out how to build one here. Naturally, this year I wanted to use my love of colors, specifically jewel tones, in our holiday decor. Now this years decor is totally different from my color palette last year, remember this is what my room looked like last season. This year I wanted to use vintage inspired decor in bright and cheery colors throughout the room and this trio of trees from the Bright and Festive Collection, was the perfect palette to kick off my new decor this year. Vintage ornaments are not the easiest to find in mint condition. I can hardly keep my ornaments safe and they aren’t vintage. Instead of searching all over for authentic vintage ornaments I choose these vintage inspired Witch’s Eye Ornament set in red and green. This ornament set is hands down one of the prettiest and most authentic looking I have seen. They are truly stunning! To add to the vintage inspired look I added some toy cars. They are not antiques but they are very sentimental as they were given to us by my father in law who is no longer with us. I love using objects in our home that remind the kids of special people in their lives. Objects like this little car is a great way to for us to remember Granddad and how much he loved these boys! The Christmas Season is by far my favorite season of the year and nothing brings me greater joy than spending it with family. Believe it or not one thing that brings my family joy is holiday decorating. I’m serious! They absolutely love it when I decorate! One of my husband’s favorite things is when I decorate the mantel with garland. This Martha Stewart Living Glittery Bristle Pine Garland is one of the thickest and prettiest garlands I have ever owned and it’s pre-lit! Now I have a little secret to tell you… this room is all decorated NOW but it did not look like this yesterday. You see I got a wild idea when I found out my dad was coming in to town for a day. I figured we could do a little father/daughter bonding by demoing my fireplace tile. Remember my fireplace use to look like this here. And now it looks like this….. Yes, I am a bit of an over achiever! 4 days before this amazing home tour I ripped out my fireplace and re-tiled it with marble subway tiles. What do you think? Personally, I’m in love! I’ll have a full tutorial for you soon, I really want to focus on the demo because that really was the most challenging part! But before I show you the mess that ensued let’s enjoy what this beauty looks like now… Be sure to check out the entire Holiday Home Tour lineup listed below! You can also follow along on social media with hashtag #HDCholidayhomes. Thanks so much Meg! What a difference, right? I love their pillows! Seriously how many pillows can I order before it’s crazy? I want them all!!! Me too! And you can never have too many pillows, right? Your house looks gorgeous! I love all of the bright colors! I would buy the classic Santa Trio! Your home decorated for christmas puts a big on my face, just beautiful! I hope that’s a big “smile” right lol! Thanks so much for that!!! I love all of the bright pretty colors, and your fireplace looks gorgeous! Your tree is so happy! I love those witch’s eye ornaments. I always break the vintage ornaments, so I need to buy some of those! I need to redo the tile on my fireplace as well. Demo is what I’m most intimidated by. I’m looking forward to hearing about how yours went! It looks beautiful! Thanks so much! Yes the demo was definitely challenging. It’s totally doable just a little harder than expected. Lesley, I love it all! That bright pink is just so much fun. I like the whimsical look you have.